He begins by talking of the mridanga tala-synchronized music. I have heard many musicians quaver at the thought of a fierce mridangam accompanist. They would prefer one who simply keeps the beat and does not scare them off the cue points. They surely don’t wish to be “led” by the mridangam player. But then, the charm of a great singer accompanied by a resonant and sympathetic mridangam accompaniment is surely music for God’s ears. Then, straight away, Thyagaraja talks of the other extreme of cosmic music… the crest jewel of the Vedas (the cosmic Omkaara). The one who can evoke that music of the spheres by singing the pure notes with the right words and by weaving in the alliterative phrases, the pregnant pauses, the rich melody akin to pure grape juice (like the one served in MTR in silver tumblers)….. But to do all this you need to have true devotion. You cannot be an egoistic technician of music. You also need to have an ability to wean yourself away from this world and dip yourself in a Godly mood. You need the skill to do this, which is a bigger skill, much bigger than the skill of a successful concert musician. 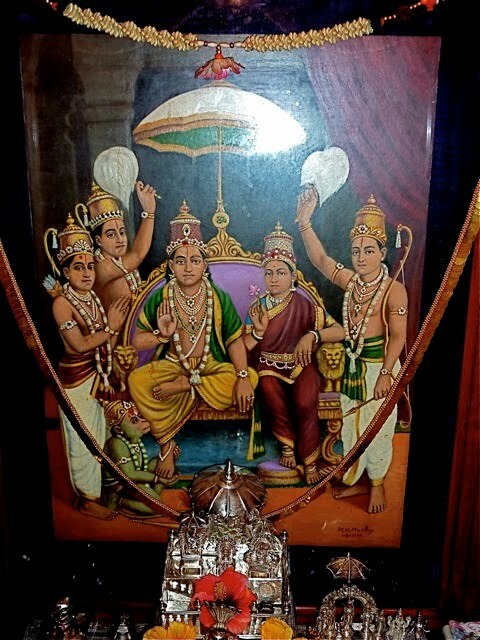 Then you become the king of renunciation… a true Thyagaraja. That is the valour of a true musician!!! Remember that this is raga Sriranjani. It means both ‘that which richly pleases’ and “that which pleases a truly enriched one”. I think Hanuman had this valour. He brought Sanjivani, not just grape juice for Rama. He dared to cross the ocean and tackle Ravana’s army to meet Sita and bring the glad tidings. Thyagaraja praises Hanuman’s knowledge of the Gita as well as Sangita. What a valiant one indeed. Want to listen to such music? Click here to hear MSS sing in Parvathi, Mysore (1967 chamber concert).